Like many people I found myself toting along those small envelopes of instant maple and brown sugar oatmeal to work. We all know that oatmeal is so good for you and keeps you full and gives you lots of energy for the morning so it’s good to eat but…… I don’t know about you but my initial reaction when eating the stuff from the envelope wasn’t ever ‘wow yummy!’ it was more along the lines of ‘wow it’s glue’. Yuck. For a while I was measuring out 1/4 cups of rolled oats and bringing them to the office too which was somewhat better but still pasty. 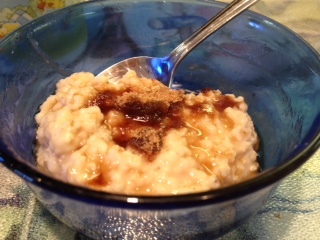 Recently I was inspired by one of the America’s Test Kitchen episodes that featured steel cut oats and how to cook them overnight to avoid the 45 minutes of cooking in the morning that they normally take. So I bought a can (how retro) to see what I could do. I was thinking if I can cook them overnight then reheat in the AM why can’t I cook them normally and then reheat? And I can!! And how easy it is!!! There’s literally 2 minutes of attention that you have to pay to the pot during the whole 40 minutes that it’s cooking (aside of a few stirs). I let it cook while I vacuumed yesterday. Do you know that steel cut oatmeal reheats amazingly well? The texture is still al dente (for lack of a better way to say it) and the flavor is the same as when it was first made. Below you will find instructions for a week’s worth (plus a pretty good sized bowl right away) of small containers of steel cut oatmeal. I prepare it on Sunday and pack it into small 1/2 cup containers to bring to the office all week. So give it a try! I’m sure that you won’t want to go back to the paste after this. In a small nonstick stockpot bring the water to a boil and add salt. Stir in oatmeal and reduce heat to low. Cook for 25 minutes, stirring occasionally. Add the vanilla, syrup and milk and stir until thoroughly combined. Cook for another 10 minutes, stirring occasionally. At this point you’re ready to eat it. Enjoy!!! If you’re going to store it to eat later allow the oatmeal to cool in the pan, stirring from time to time. When it’s cool spoon it into containers with lids and keep it in the fridge. I used 1/2 cup containers. To eat I put the oatmeal in a small bowl, break it up with a spoon and microwave for a minute or so until it’s hot. Then I sprinkle with brown sugar and drizzle the syrup on it. YUMMY!! I love love love oatmeal cookies (but only those without raisins) and could eat brown sugar straight out of the jar it’s so delicious. And then there’s coconut. Delicious crunchy flaky coconut bits that remind me of sitting on a beach drinking one of those drinks where the top of the coconut has been hacked off. In other words this cookie is a culmination of 3 of my favorite things. It’s soft. It’s chewy. It has a little crunch from the coconut chips. 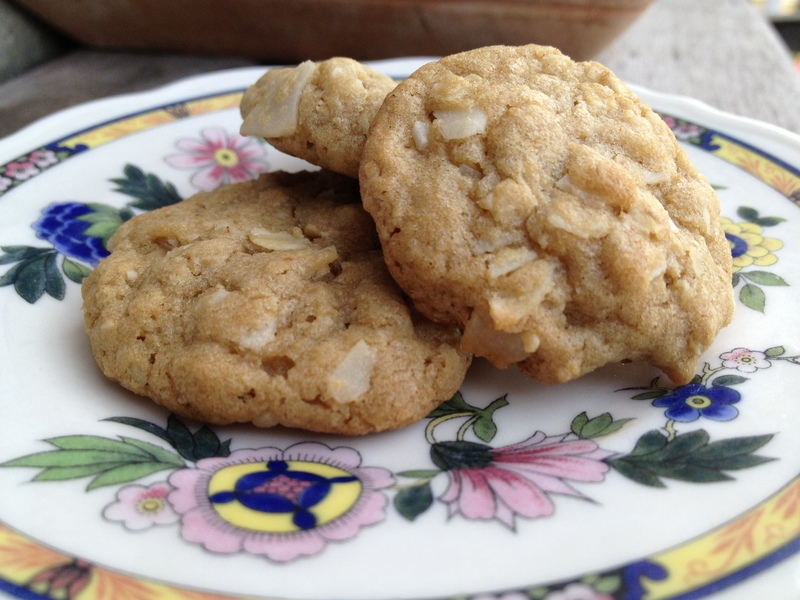 Look-you can see the bits of the oatmeal and coconut flakes right there in the cookie. I know I was helping myself to the raw batter-bet you will too. Make them. Today. Right now. 1 & 1/2 cups unsweetned flake coconut, crushed into small bits. Preheat oven to 350F and prepare a baking sheet with parchment paper and set aside. Add butter, brown sugar and white sugar to the bowl of a mixer and cream together until well combined. Add one egg at a time, mixing each until fully incorporated. Add the baking soda, baking powder and salt and mix until well combined. Add the flour in increments and mix until incorporated each time, scraping down the bowl often. Add the oats and coconut and mix until evenly incorporated. Make small 3/4 inch in diameter balls of dough, place them on the prepared baking sheet 1 inch apart. Bake in the preheated oven for 7-9 minutes until the edges are very very lightly browned and the center is still light and puffy. Allow the cookies to cool on the baking sheet for a few minutes and then slide the parchment paper onto cooling racks (thus saving washing the cookie sheet and racks and getting crumbs underneath the racks). 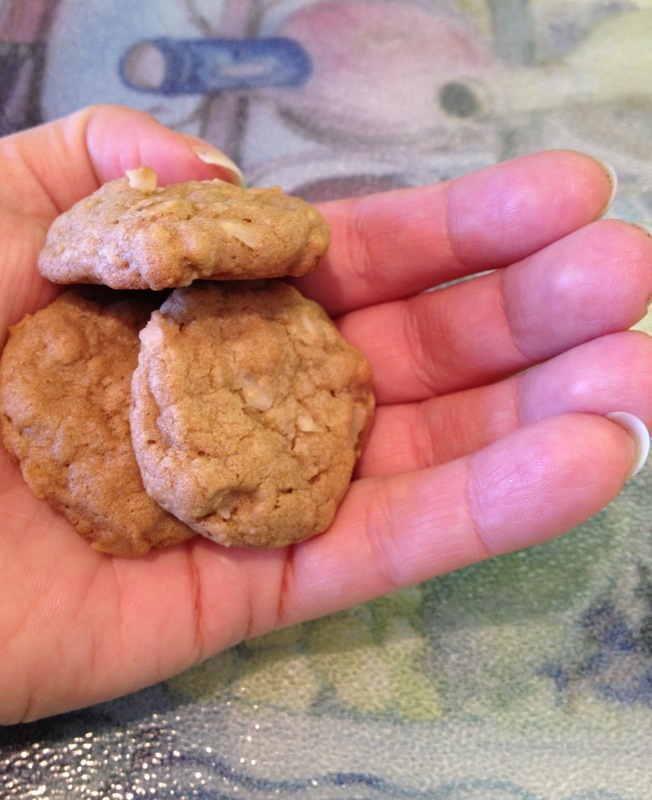 I made these small bite-sized cookies for the April What’s Baking challenge. The theme this month was ‘bite-sized’ so I made the cookies very small. Small enough to fit 3 in my hand. Makes approx. 60 cookies. I froze half of the dough and only made about 30 cookies. 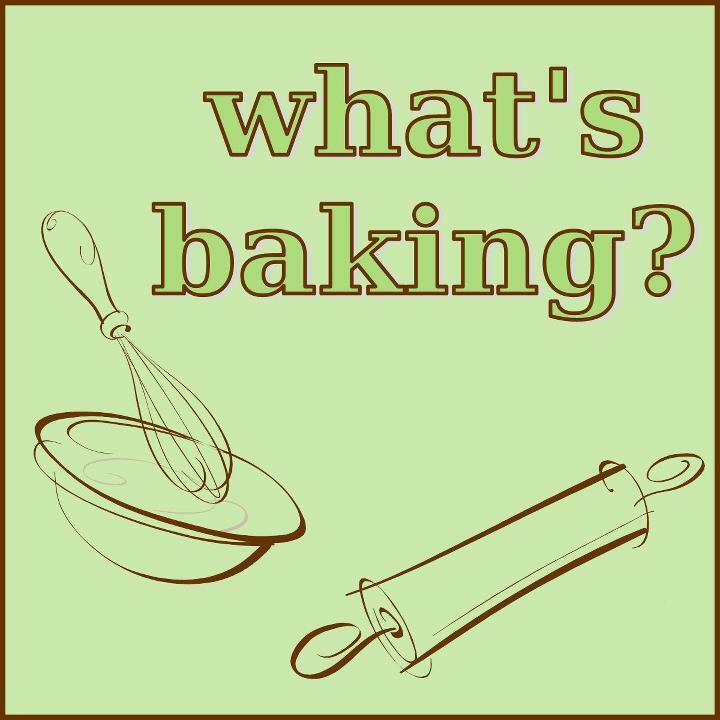 Here’s the link to the round-up of all of the other April What’s Baking goodies. How great everything looks!!! Adapted from The Dough Will Rise Again.